This February we are pleased to join the American Association for Cancer Research in supporting National Cancer Prevention Month. An estimated 1,762,450 new cancer cases will be diagnosed—more than 4,800 each day—and 606,880 cancer deaths will occur in the United States this year. Roughly half of these cancers will be attributable to preventable causes. As with heart disease and stroke, the U.S. has made remarkable advances in reducing cancer morbidity and mortality. Because of the steady decline in smoking and advances in early cancer detection and treatment, the U.S. cancer death rate dropped 27% in 25 years. However, not all populations have experienced the same decreases in cancer mortality. Cancer death rates are higher among males than females for every racial and ethnic group. Overall rates of cancer mortality are highest among African Americans and lowest among Asian/Pacific Islanders, but rates among these groups vary substantially by cancer site. Furthermore, mortality rates may be underestimated for populations other than non-Hispanic white and non-Hispanic black groups due to incomplete information on race/ethnicity in medical records. Efforts to characterize, understand, and address disparities in rates of cancer diagnoses, treatment, and outcomes among various U.S. subpopulations should be a core component of cancer prevention and treatment strategies at all levels of research and practice moving forward. Obesity is a major risk factor for the development of at least thirteen cancers: colorectal, esophageal (adenocarcinoma), gallbladder, gastric cardia, kidney, liver and intrahepatic bile duct, meningioma, multiple myeloma, pancreatic, thyroid, uterine corpus, premenopausal breast, and ovarian cancer. Estimates suggest that more than 144,000 of U.S. cancer cases were attributable to obesity in 2017. 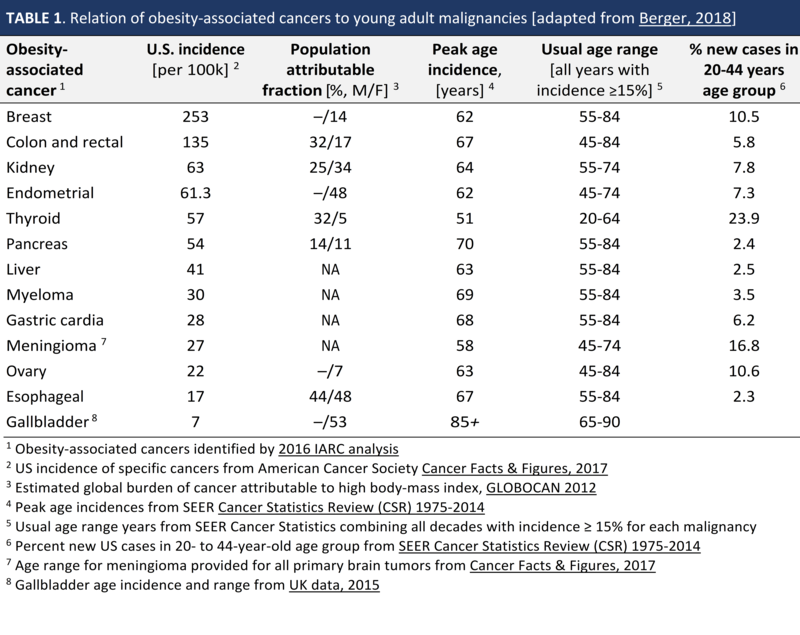 Table 1 details the U.S. population attributable fraction (PAF) as the percentage of each malignancy attributed to obesity for both males and females. Five of these cancers rank among the twenty highest-incidence cancer sites in 20- to 39-year-old females (premenopausal breast, thyroid, uterus, ovary, stomach) and males (colorectal, thyroid, kidney, stomach, liver). The apparent increase in the incidence of several obesity-related cancers among young adults is cause for additional concern. In a newly published study by Sung et al, researchers from the American Cancer Society pooled data from 25 state registries to assess changes in the age-specific incidence of 30 invasive cancers, including twelve obesity-associated cancers. The authors found significant increases in the incidence of six obesity-associated cancers (multiple myeloma, colorectal, uterine corpus, gallbladder, kidney, and pancreatic cancer) among young adults (25–49 years) diagnosed between 1995 and 2014, with steeper rises in successively younger birth cohorts. In contrast, the incidence of smoking and HIV infection-associated cancers appeared to decrease among this population. 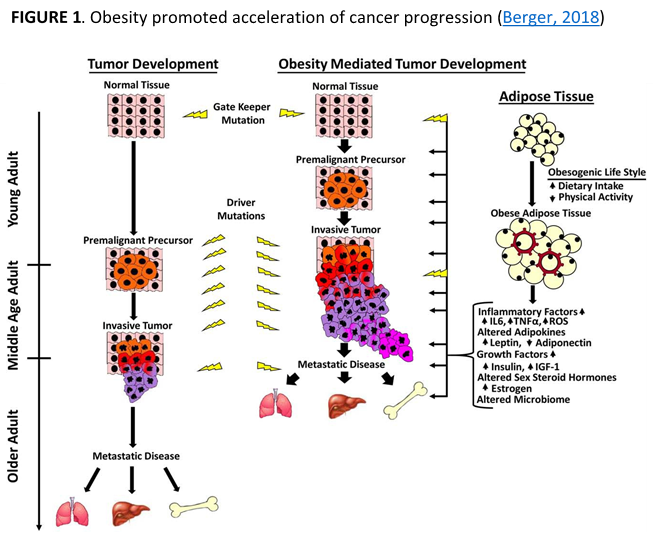 Figure 1 provides a conceptual model of how obesity may contribute to the appearance of specific malignancies at younger ages by accelerating the cancer development process. Sung et al.’s findings—largely corroborated by 2018 statistics from the American Cancer Society—add to an ominous, rapidly expanding body of evidence that highlights the young adult age group as a particularly salient target for intensifying efforts to reduce obesity as a cancer prevention strategy. 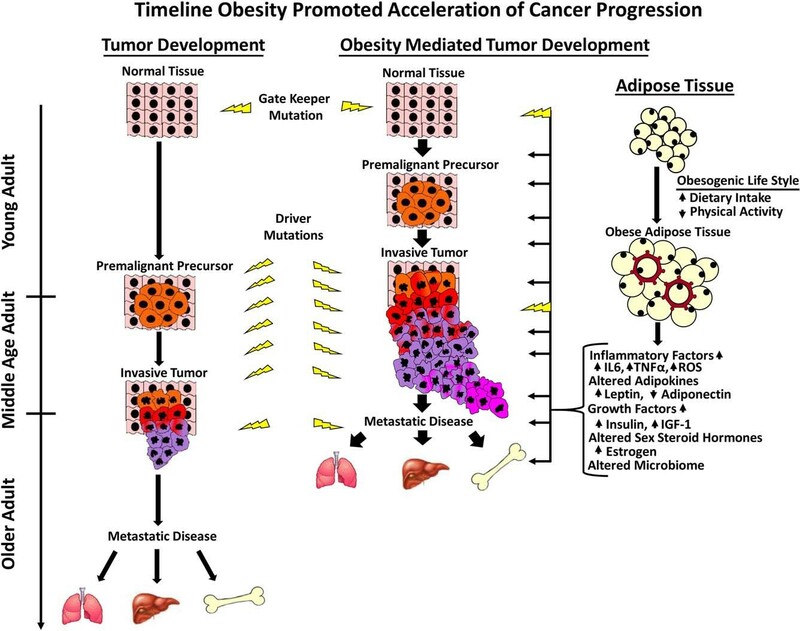 It is clear that obesity-associated cancers are on the rise. In light of the downward trend in U.S. life expectancy, even a small increase in cancer incidence rates among young adults should prompt us to redouble our efforts to prevent and treat obesity.